U-SoA offers a variety of study abroad programs. These courses are credit-earning, fulfilling required and elective components of the curriculum. The Rome program is offered every year and University-sponsored exchange programs are also available. Semester break and Summer session programs have been held in England, France, Italy, Spain, Greece, Germany, Egypt, Japan, China, and India, as well as in various U.S. cities such as Charleston (SC), Chicago (IL), New York (NY), Savannah GA, Seaside (FL), and Williamsburg (VA). 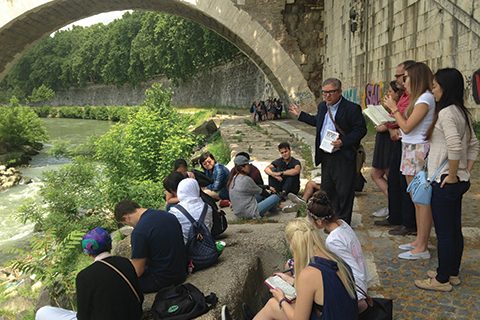 Travel study enriches both the study and the practice of architecture by expanding student experiences. With advance preparation and consultation, high school seniors may also apply to selected Summer travel programs as an introduction to architecture. Additionally, a number of programs offer professional, continuing education credits. Domestic travel is often a part of design studio courses, introducing students to different topographies and cultures. Study trips to observe the architecture of cities may take students to cities such as Charleston, Chicago, Key West, Montreal, New York, Savannah, Seaside and Williamsburg, as well as to various construction sites in South Florida.